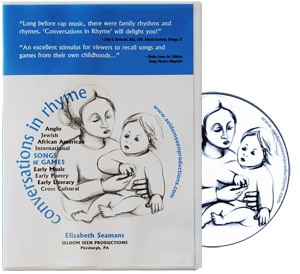 Conversations in Rhyme unfolds in five short parts that celebrate children's first games – finger plays, hand games, even lullabies. Pittsburgh Songs: singing in the streets. This film was shot in the streets and neighborhoods of Pittsburgh, Pennsylvania, with support from the National Endowment for the Arts and the McFeely–Rogers Foundation. The first portion of this film, Kisha's Song, has been shown to children and families visiting the Museum of Modern Art in New York at regular intervals for over 30 years as part of their "Family Films" program. Interestingly, Kisha's Song is frequently used in educational and child mental health settings as well.